Pochettino is believed to be United's top choice to succeed Mourinho following his sacking on Tuesday. But reports following Mourinho's exit suggested Pochettino is privately open to the possibility of moving to Old Trafford. The 46-year-old is understood to have been frustrated by the lack of backing he has received in the transfer market -- with Tottenham unable to make a single close-season signing this year. Pochettino is also vexed by Tottenham's tight wage structure and the failure of chairman Daniel Levy to sell players he no longer wants. "What is going to happen in the summer? What is going to happen tomorrow? No one knows. The most important is to enjoy the journey. I'm so happy here," he told reporters on Tuesday. "What is going to happen is not in our hands, I mean the decision in another club, we don't know. "That is not my business and then I will not waste time or energy because my focus and energy is in Tottenham." Pochettino, preparing for Wednesday's League Cup quarter-final at Arsenal, emphasised he is happy at Tottenham, where he has earned a reputation as one of the brightest young coaches in the world. "It is not my business if something happens in another club, like in many, many clubs around the world," he said. "I am happy here in Tottenham and I have four-and-a-half years left on my contract. "There are a lot of rumours but, look, I am happy here trying to give my best to the club." 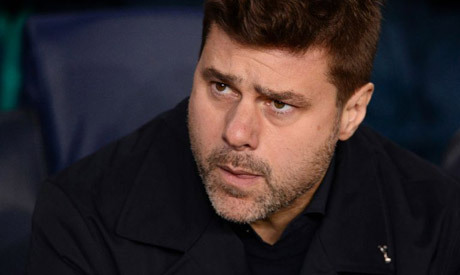 "It's not in my hands how to manage all of these rumours," said Pochettino, who has also been linked with a move to Real Madrid when they hire a permanent coach at the end of the season. "I am not creating rumours, I am here. The players doesn't care too much about what happened about the rumours. "We are focused and we are going to be focused on our job and then we are very professional. "We were talking a few weeks ago and I said if a chairman or president is going to support you, then it's because you are going to be sacked the day after. "That job is so tough because nobody in football can guarantee you are going to be here tomorrow." "I think he's very happy at Tottenham," the Spaniard said. "I think he's coaching a very big team with a very big player and now they are in the Champions League they are also in a better position in the Premier League than Manchester United. "I think his performance at Tottenham is very big. I don't know if he's thinking to change for another club, but I am looking at him with a very big commitment to Tottenham."